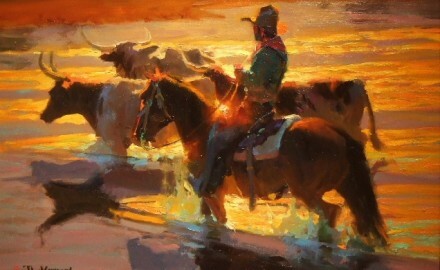 A representational oil painter of cowboys, both historic and contemporary, Dan Mieduch has lived in Arizona since 1975. He was born in Detroit, Michigan, and was drawing by the age of seven. During high school, he took night art classes and began working in both oils and watercolors. His father had a bar, and he sold his wildlife paintings to patrons for forty dollars each. He earned a B.S. Degree from the University of Michigan in industrial design in 1969 and then served in the Army Medical Corps for eighteen months as a command artist in the Canal Zone. 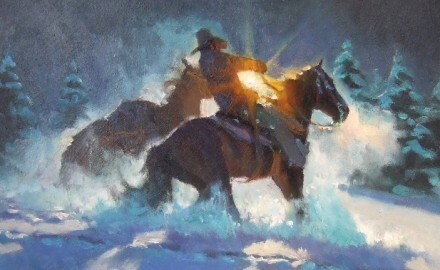 He worked for a commercial illustration studio in Detroit, and then determining to be a fine artist, focused on what he perceived as a simpler time–the early 20th century American frontier. He moved to Phoenix, Arizona where he has had gallery representation and a successful career.